Are you thinking of buying kitchen appliances? 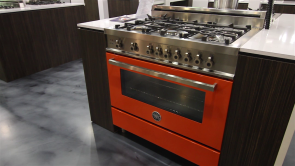 Interior Decorator Lisa Reis visits the Distinctive Appliances showroom at SOFA and gives some great advice you can use when it’s time to start shopping for major kitchen appliances. Lisa focuses on some key points and gives useful tips to make buying kitchen appliances quick and easy. SOFA is a one-stop design center; an amalgamation of permanent interior design showrooms for trade-only interior design professionals, manufacturers, buyers and dealers. Their evolving 200,000 sq. ft. space is a thriving conclave, open from 10 am – 4 pm Tuesday through Thursday. The elegantly designed, luxuriously appointed showrooms in our design center feature top Canadian, and many of the world’s most sought-after manufacturers of home furnishings and accessories, along with top commercial and hospitality manufacturers and distributors. For more information visit SOFA at visitsofa.com. Since 1980, Distinctive Appliances Inc. has been offering you the most renowned and reliable brands of the household-appliance industry. Matching innovation, performance and sophisticated style, they are state-of-the-art within the market. Distinctive Appliances Inc. is known for distributing top-of-the-line products, but also for its outstanding client servicing. You can count on a dynamic and considerate team because your satisfaction is the priority. For more info visit distinctive appliances at distinctive-online.com. Did you enjoy this tip? Check out lifestylevideos.com for more. Also make sure to follow us on twitter.com/lifestylevideos @lifestylevideos and like us on facebook at facebook.com/LifestyleVideoscom.